Read This and Get Happy 3 Questions: 1. Do you ever compare yourself to others, and come up feeling small or inferior? 2. Do you ever feel worthless or feel you get in your own way? 3. Do you long for a easy way to feel wonderful and be happy again - anytime you want? If you read nothing else, read this book, because... 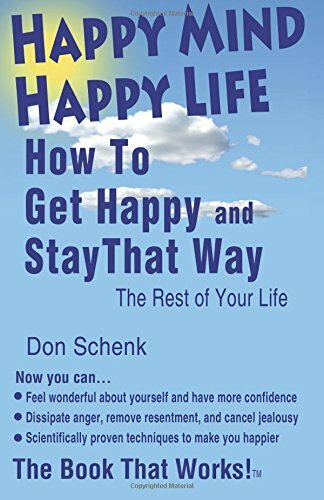 In Happy Mind Happy Life you will discover: How to recognize and blow away the hidden beliefs that hold back your happiness. How to stop the negative inner voices that work against you. It's the self-talk that says, "Things never work out for me, so why try?" "I always screw up." "I'll never be a success." "I'm such a loser." How to dissipate anger, remove resentments, and cancel jealousy. How to use the powerful technique that social scientists have proven is the easiest, most lasting way to become happy. It will work for you too. How you can help others feel better about themselves by revealing these techniques to them. This just might become your favorite book. Want To Get Happy Fast... and Stay That Way? Yes, there is a "happiness process. Happy Mind, Happy Life guides you through the obstacles and road blocks that keep you down. It shows you how to feel wonderful and confident, how to be happy fast, and how to make these good feelings last. Have you ever compared yourself to others and felt somehow you are not as good as they are, or not as happy as they are? Have you ever felt sad about yourself, perhaps even felt inferior? Do you want to feel happy and more confident about yourself? Then if you read nothing else, read this book, because... Happy Mind, Happy Life you will discover... How to recognize and remove the beliefs that hold back your happiness. How to dissipate anger, dissolve resentments, and cancel jealousy. How to turn off the negative inner voices that work against you. It's the self-talk that says, “Things never work out for me.” “I always screw up.” “I’ll never be a success.” “I‘m such a loser.” How to feel good, and feel more confident about yourself quickly, anytime. How to use the powerful technique that social scientists have proven is the easiest, most lasting way to become happy. It will work for you too. How to stay happy the rest of your life! How fear causes procrastination, and how to move beyond fears. How you have become addicted to certain types of thoughts, and how you can vaporize that thinking. How to be more successful, because studies prove happier people have more success. How you can help others become happier too by revealing the happiness process to them. Would You Like To Know More? Do this: scroll up and select the buy button, because this book just might become your all-time favorite.